It was a productive first day back in the office for me today after almost two weeks of one quarter work trip and three quarters vacation. Public Relations is an industry that never sleeps so in that short span of time I feel like I already missed a lot. I spent most of the day catching up and reading my 112 unread emails and the latter part eating my heart out at a food tasting for our newest client. All was well. Our vacation felt too short and I really wanted to stay some more, but a little part of me also looked forward to being in my work desk again. 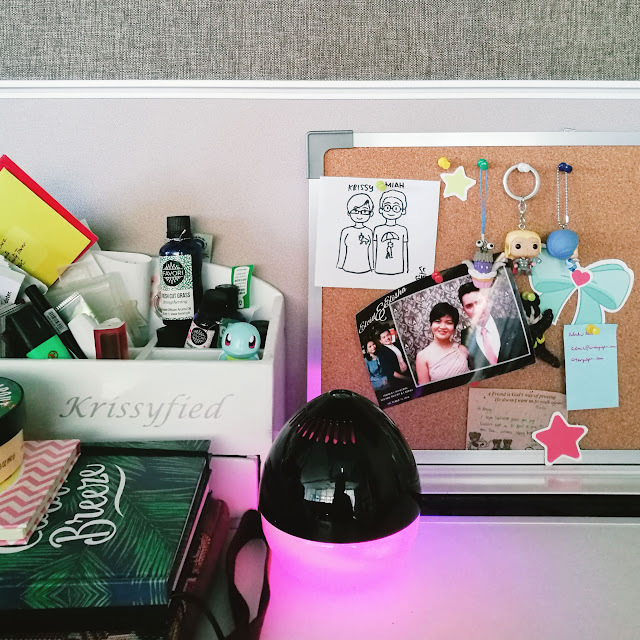 We transferred to a new office unit (in the same building) and I have a new work desk that I organized in my own way - serenity in chaos-style. Aside from my toys and the creative mess I've made, one of my favorite work desk buddies is my FAVORI Egg Aerator. I've collected quite a few oils that I rotate according to my mood. I can say it has helped me tremendously by perking up my spirits even when I'm already stressed. I really love it and you should get one for your work desk, too! In case you're interested, FAVORI is having a special Buy One, Get One Promo for all their mall customers tomorrow, April 20, in celebration of their 3rd Anniversary! The Buy One, Get One Promo applies to all Aroma Products (except Aroma Devices) — Aroma Oils, Regular and Premium Reed Diffusers, Soy Aroma Candles, Aroma Pouches, Salves, and Massage Oils, as well as Home, Mood and Activity Sprays. You'll get the same product type as the one you bought, but scent variant will depend on available stocks so make sure you go early! I am definitely taking advantage of this Anniversary BOGO promo tomorrow and stocking up on my favorite Aroma Oils. (Fresh Cut Grass, Cranberry Wine, and Rain Dance in case you're wondering.) I might also get a Premium Reed Diffuser as a house-warming present to my boyfriend's family. FAVORI has stores in Robinson’s Place Manila, SM Megamall, SM Southmall, SM City Marikina, and Market! Market! which is the branch nearest to my office. :) Take note that this offer is valid for mall customers only and does not apply to online store purchases.